Shrimp exports from developing countries - including Indonesia - are bringing foreign exchange earnings to exporter governments and profits to entrepreneurs. But the real price is being paid by communities whose coastal resources are wrecked both by commercial shrimp farms and shrimp trawling. Forestry Minister Prakosa warned in May this year against the total destruction of mangrove forests in Indonesia. He said that strong determination and commitment was required to prevent further damage. 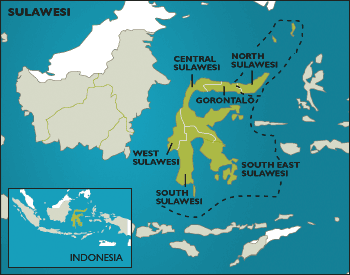 On July 21, one 30-year old man was killed and another was reported to be in a critical condition after police shot at villagers in Bulukumba, South Sulawesi. Four of the injured were suffering from gun-shot wounds, according to media reports. Another man died on July 25th, during surgery to remove a bullet from his leg. Indigenous Peoples walked out of a meeting with the British government aid agency, DFID, in March, in response to a controversial statement by a senior Indonesian government forestry official. Around a hundred people from indigenous groups, local communities and supporting organisations refused to continue DFID's second annual Multi-stakeholder Forestry Programme meeting in Yogyakarta following comments by the Indonesian forestry ministry's secretary general. April the 22nd - Earth Day - saw more protests against the Toba Pulp Lestari (TPL) plant (formerly Indorayon) which was reopened earlier this year. Environmental organisation WALHI, plus a host of national and local NGOs and community groups, dedicated the events to the people and environmental campaigners of Porsea, who have long suffered from the mill's pollution.